Magizhampoo thenkuzal also called as mullu murukku. For this thenkuzal we use three different dals - moongdal, chana dal and urid dal. These dals are roasted to bring out the aromas and then powdered. 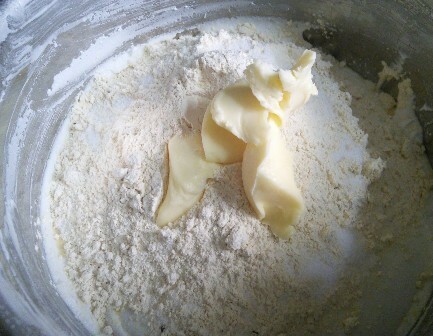 The freshly ground flour is mixed with the ground rice batter. The magizhampoo thenkuzal cooked in your house will delight you. Grinding the rice is a superb way to prepare thenkuzal or thattai. 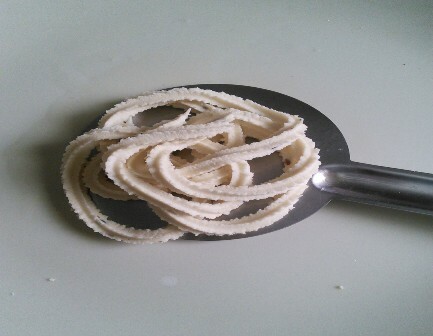 It gives the perfect shape, taste and texture of the dish. The thenkuzal stays fresh and flavorful without adding fried gram flour. 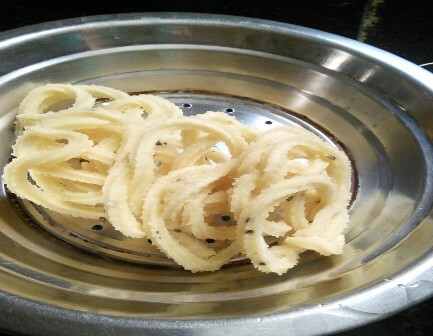 Deep frying the thenkuzal can be coconut oil, groundnut oil or vegetable oil, depending upon the flavour you want. 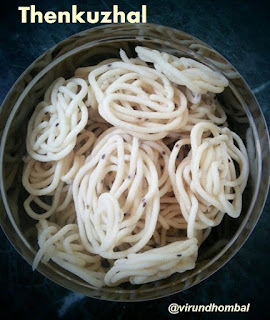 I recommend coconut oil for thenkuzhal because the flavour in the coconut oil, add extra taste for the thenkuzhal. Roast the dals separately. Do not brown them. Sieve the flours 2 or 3 times and add it to the ground rice batter. Soak the rice for 3 to 4 hours. 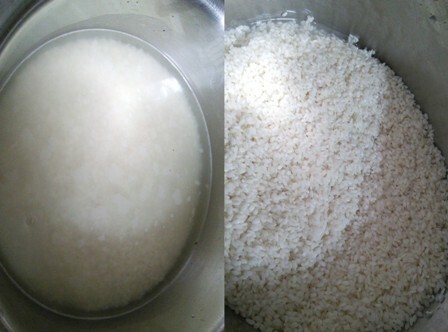 Grind the rice to a smooth paste with little water. Add the butter in the room temperature. 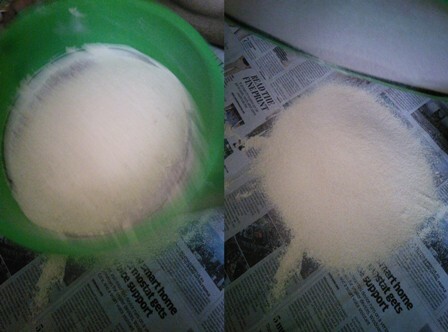 Never pour water to the ground rice batter. After adding the roasted dal powder sprinkle little water if required. Generally for this method, it doesn't require any water after grinding. 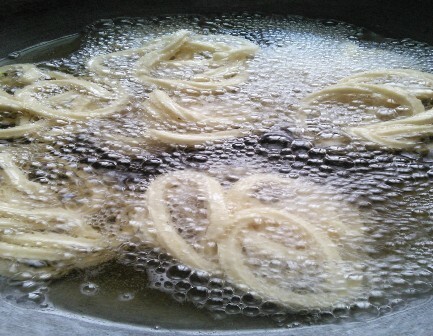 For uniform cooking do not increase and decrease the flame when frying the thenkuzal. Always keep on low medium flame for perfect results. Avoid frying on high flame. 1. Wash the rice 3 times in water and add 8 cups of water. Soak the rice for 3 to 4 hours. 2. Heat a pan and dry roast the chana dal. Stir and roast the dal on low flame. In the same pan, roast the moong dal. When you see light brown colour on few dals transfer it to the plate. Finally, add the urid dal. Roast it till light golden brown and transfer it to the plate. 3. Now add the dals in the mixer jar and powder them. Sieve the flour 2 times. 4. After 3 hours, drain the water completely. Now add it to the wet grinder. Grind it to a smooth paste. 5. Now transfer the ground rice batter to the wide vessel. Add the dal flour, unsalted butter, sesame seeds and required salt. Mix them gently and evenly. 6. Grease the thenkuzal press with little oil. 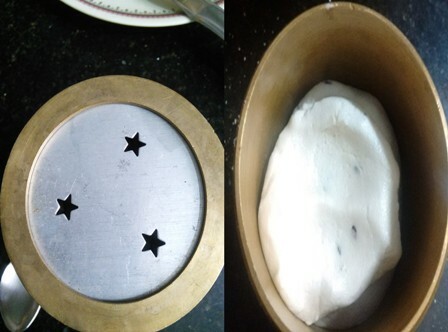 Use star shape plate for this thenkuzal.Take a handful of the prepared dough and make oblong shaped balls. Now keep the balls in the thenkuzal press and close it with the press lid. Squeeze the thenkuzal on a greased ladle. 7. Heat the oil on low medium flame. When the oil is hot, add the thenkuzal one by one. After 3 minutes, gently flip them and fry till the shhh sound completely stops. Take the thenkuzal one by one with a murukku needle. Drain them and add it to the airtight container. 1. Take a broad vessel and add the idly rice. Wash the rice 3 times in water and add 8 cups of water. Soak the rice for 3 to 4 hours. 2. While the rice is soaking, let us prepare the dal flour. Heat a pan and dry roast the chana dal. Stir and roast the dal on low flame. When you notice some dals change its colour quickly transfer it to the plate. (Do not brown the dals fully). In the same pan, roast the moong dal. When you see light brown colour on few dals transfer it to the plate. Finally, add the urid dal. Roast it till light golden brown and transfer it to the plate. Allow them to cool completely. 3. Now add the dals in the mixer jar and powder them. Sieve the powder and keep the dal ravas (kurunai) separately in a bowl. You can add this rava when grinding the rice. 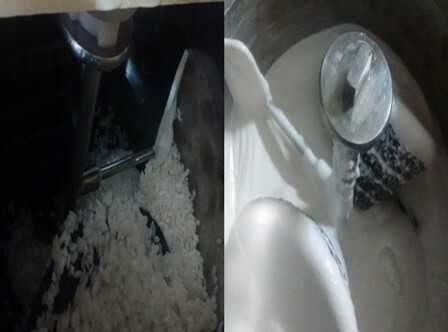 If you are preparing the flour in large quantity, you can grind the flour in the rice mill. 4. After 3 hours, drain the water completely. Now add it to the wet grinder. Grind it to a smooth paste. With regular intervals, add water and scrape the rice from the sides of the drum. If you have the leftover dal ravas (kurunai) add it to this rice and grind it. Grinding process will take around 25 to 30 minutes. (No need to add any water). Be careful while adding salt because if you add more salt it will reduce the crispness. 6. Grease the thenkuzal press with little oil. 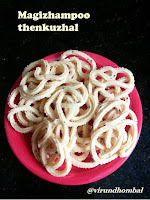 Use star shape plate for this thenkuzal. Take a handful of the prepared dough and make oblong shaped balls. Now keep the balls in the thenkuzal press and close it with the press lid. Squeeze the thenkuzal on a greased ladle. 7. Heat the oil on low medium flame. When the oil is hot, add the thenkuzal one by one. (You can add 7 to 8 thenkuzhal for 1 batch). After 3 minutes, gently flip them and fry till the shhh sound completely stops. 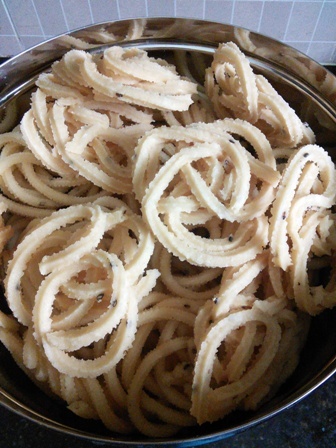 Take the thenkuzal one by one with a murukku needle. Drain them and add it to the container. 8. Repeat the process for the entire dough. Once it cooled down to room temperature keep the thenkuzhals in an airtight container.